I’m so disappointed we didn’t get a chance to go apple picking this year. We’ve been busy most weekends and I wanted to go last weekend, but the orchard that we go to was picking everything they could before we had the first frost. I guess I’ll just have to buy a large basket to make applesauce for the kids. I did have a couple apples laying around that needed to be used up. I looked through some of my many cookbooks and found this recipe for an apple strudel using puff pastry. Genius! That’s so much easier than phyllo dough, which I’m not a fan of. 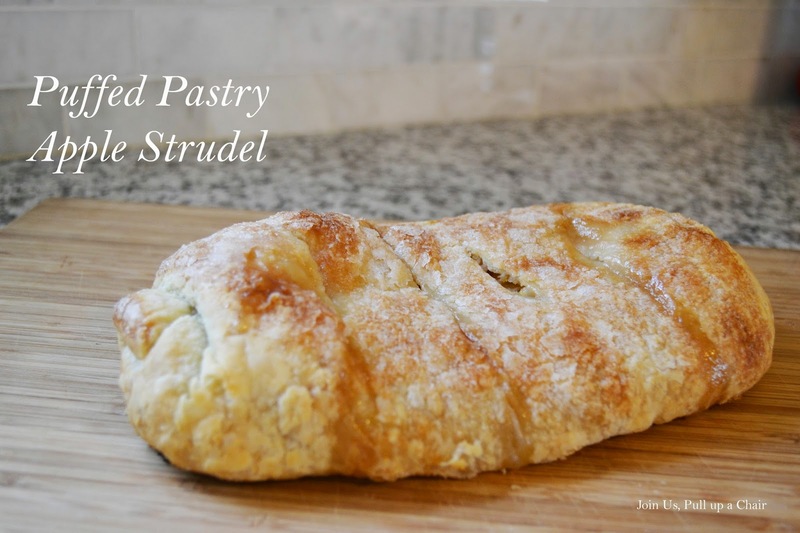 This strudel was so simple to make and took no time at all! It was also devoured in no time at all too! I share a couple slices with some friends who saw me sneak peek it on Facebook. I have another piece of frozen pastry and I know I’ll be making it again once I get more apples. Preheat oven to 375 degrees. Line a baking sheet with parchment paper and set aside. Roll out the puff pastry on a lightly floured surface into a 13×13 inch square. In a large bowl, combine the sugar and lemon zest. Add in the sliced apples, lemon juice and cinnamon, combine. Brush the pastry with 3 tablespoons of melted butter and top with the bread crumbs. Leave a 2 inch border around the edge. Next spread the apple mixture over the bread crumbs. Fold the long sides of the dough over the filling and start to roll from the short side. Seal the edge and place edge down on the baking sheet. Brush with remaining butter and sprinkle with sugar. Cut four slits into the top to let steam escape. Bake for 40 minutes or until the top is golden brown. Allow to cool to room temperature before slicing.